Anyhoo, on the Wetpixel thread the rule is just “one” (which often gets broken) photo per person, well, as this is my blog I am going to show 10 instead! No rules for me to break here.. Let me say that these are not necessarily my ten best or most original or even most popular images from the year, but rather, my 10 favourite images of the year. It was a tough bunch to choose from as I did dive in a lot of places in 2011… how about a list? Raja Ampat, Ambon, Banda, Triton Bay, Cendrawasih Bay, Halmahera, Buyat Bay, Lembeh Strait, Kalimantan Province, Bali, Lombok, Bima, Sangeang, Komodo, Flores, Alor, and not to forget Layang Layang in Malaysia. I think I have probably dove more places in Indonesia in 2011 than a small handful of other folks (like the dive guides who work with me ☺ ). So without further ado..in chronological order, 10 photos from 2011. 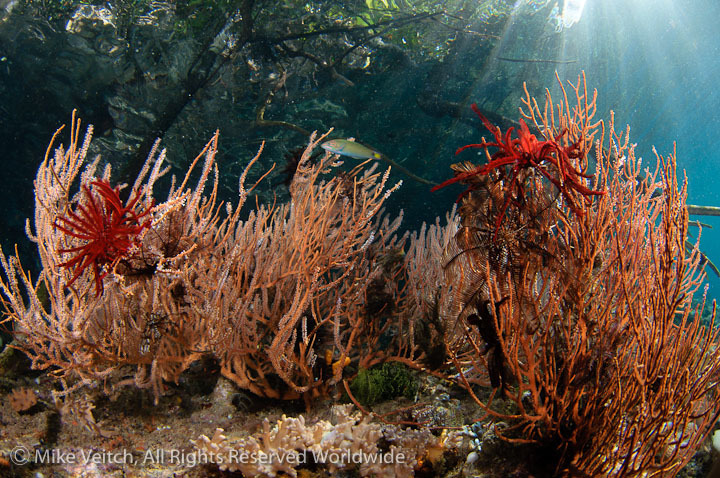 Many of you may think this comes from the Blue Water Mangroves in Raja Ampat, but it’s actually from a place called Aljui Bay also in Raja Ampat. There is a small island in the middle of the bay with wonderful soft corals and seafans that grow close to the surface of this undercut island and allow for interesting photo opps even in just a couple of feet of water. 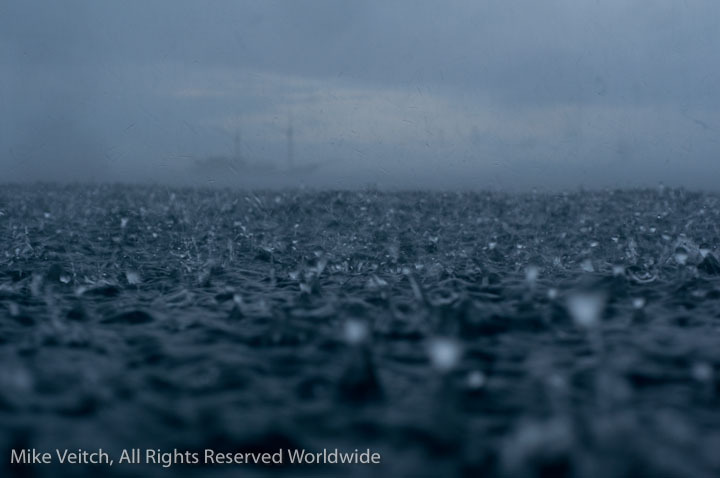 Each time I went there it seemed the conditions were overcast or the water somewhat murky, until one day when the conditions were perfect with a high tide, no wind, and bright morning sun. Staying in Aljui Bay, this is a portrait of what is called a Toadfish, a strange little fish that only comes out at night and makes a loud “ribbit” sound like a large toad. I had heard the croak of these guys many times in Raja Ampat but had never seen or photographed one. 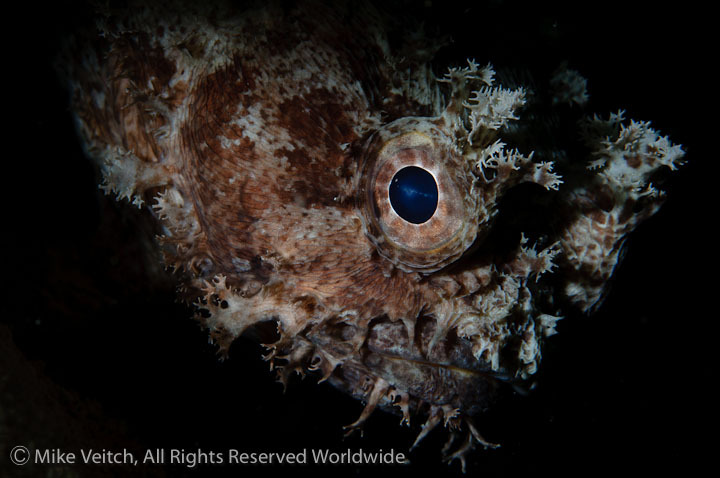 Therefore, each time we visited Raja Ampat in 2010 and 2011 I would go night diving in Aljui Bay as it’s a great location to see these very interesting looking fish. For those of you who know me well you may say to yourself…”what? Mike, night dive? By choice? I don’t believe it!” Well, this photo is proof! Actually, it took me three night dives over three charters to finally get this little guy (around 30cm or 12 inches long) who was tucked under a small coral head in just 8 m (25 ft) of water. Cendrawasih Bay in Indonesia is the hotspot of Whaleshark action at the moment and I had the chance to visit there early in the year. 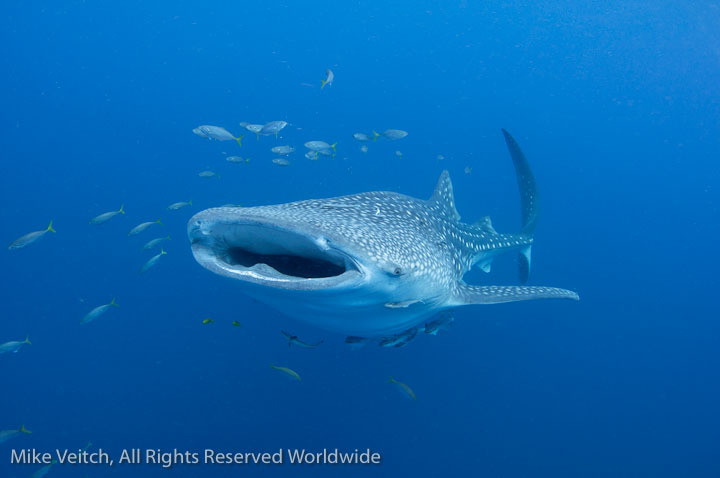 With up to 6 whalesharks at one time swimming around our group of divers, the encounter certainly didn’t disappoint. My favourite image is this one with a single shark surrounded by a school of fish and its mouth slightly open as it was in the process of yawning. 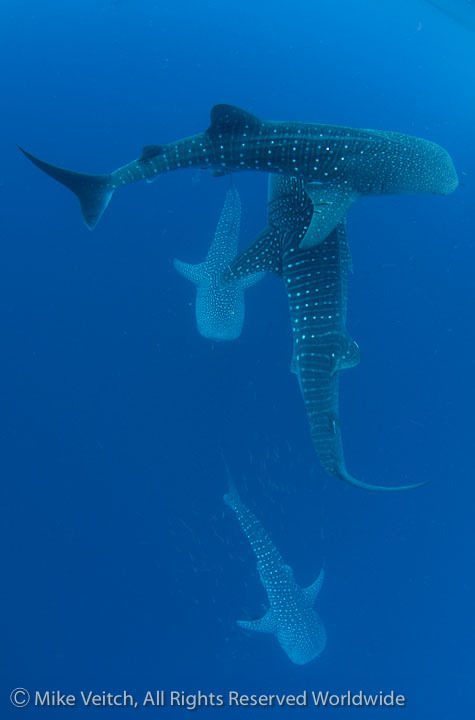 On the same day, I was able to capture 4 whalesharks in one frame, I thought this was pretty outstanding as there aren’t too many photos out there with multiple whalesharks in it, never mind 4! When I lived in Palau back in 99-02 I would visit the jellyfish lake there quite often with my Nikonos V and take multiple photos each week. 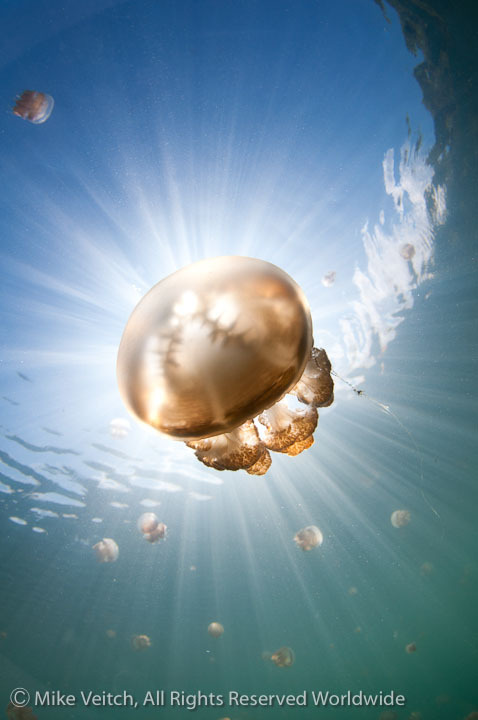 One of my more enduring photos from that time is of a backlit jellyfish that went on to win several photo competitions. My trip to Kakaban in May was my first time to visit a jellyfish lake with a digital camera and I was definitely looking forward to recreating that image to see how it would look. Well, I couldn’t have been happier with the results as the ease of composing with an SLR was much easier than the Nikonos as well as the colour contrast seemed to be superior, at least compared to the scanned slide. The two tone green and blue with the starburst sunrays really works for me and it may be my favourite image of the year. It’s no secret that I wasn’t too impressed with the diving in and around the Derawan/Sangalaki area which includes Maratua and Kakaban. The highlights for me were exactly two sites, Jellyfish Lake (a snorkel) and “Turtle Traffic” on Maratua. Turtle Traffic was not a nice reef, as the coral was mostly beat up and not photogenic, however, we encountered over 40 green turtles on a single dive! 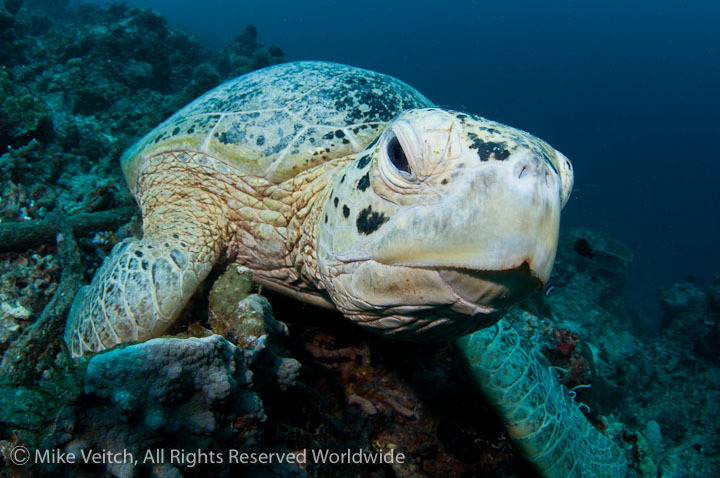 That is a pretty impressive number as most dives I have been on in my life may feature just one or two turtles on a dive if luck is on my side. To have over 40 turtle encounters in an hour is an amazing number, especially when I was able to get 8 of them together in one frame! This truly was a special place and this large turtle was the most photographic of the lot as she just sat there batting her eyes a few times and I composed a couple of photographs of her. I do love my nudibranches, and Bima Bay, a little known but very productive muck diving area, is full of them. 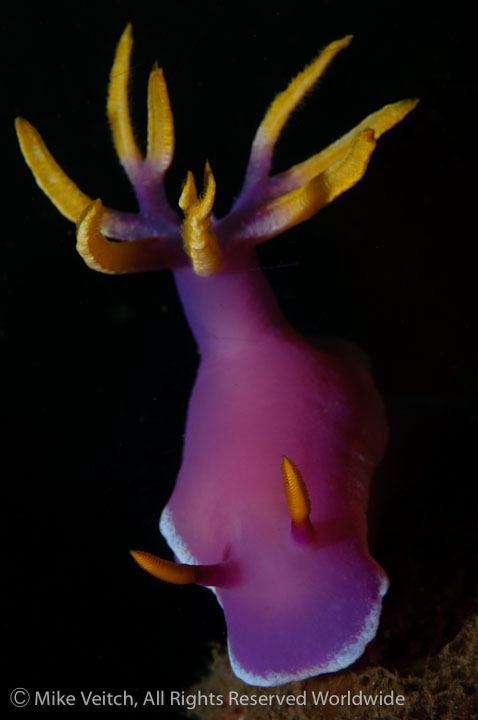 It also seems to have a high number of the visually striking Hypselodoris bullocki nudis and its close relatives which can be anywhere from a light pink to dark purple and are great photo subjects. This rather large individual was perfectly perched on top of a clump of mucky stuff and allowed me to take a low angle with a single strobe from the left. No, there is not a “snoot” involved in the lighting and neither is there any Photoshop to make the background black. 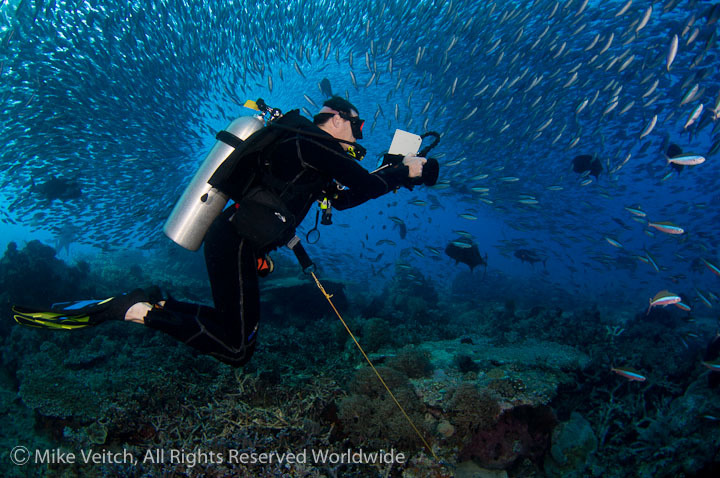 This is Brian, he is hooked in to the action on Hard to Find Rock in North Komodo filming amazing fish action going on around him. It was one of those perfect dives at Hard to Find, a submerged pinnacle, when everything came together perfectly, the current was mild, we were the only divers there, the viz was incredible, and the fish action was off the charts! Thousands upon thousands of fusiliers were pulsing close to the reef as they were herded by a number of giant and blue fin trevallies into a big fish ball in the current. As the trevallies would strike, the fusiliers would bolt toward the divers trying to avoid the large predators. It was one of those dives that no one wanted to end, so we dove it another 3 times! 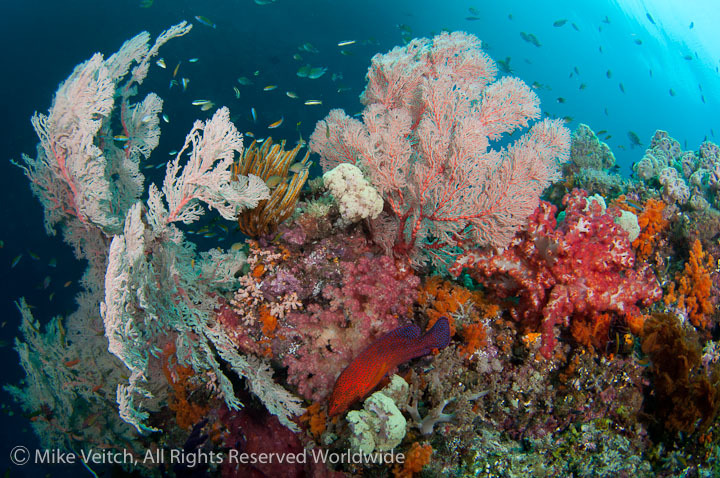 For those who have visited Raja Ampat, one thing that sticks out is colourful reef and lots and lots of fish. Well, although this is true, it’s not always easy to capture it all in a photograph. As tropical reef fish such as damsels and anthias pulse up and down close to the reef, others such as grouper and angelfish dart amongst the coral. Trying to capture the bright red Coral Trout in a wide angle scenic is a tough assignment as it tends to be a rather shy fish that sticks to shelter and swims quickly from rock to rock. In this photo, I was lucky, as this Coral Trout just happened to swim into the frame as I took the shot!